Reagan Tornado Foosball Table | Fun! 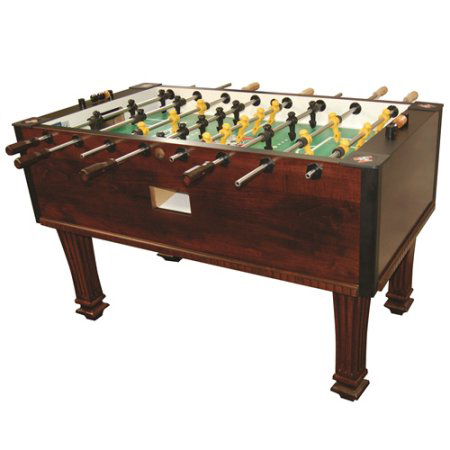 he Tornado Foosball Table – Reagan is perfect for your game room! It features a wooden finish, along with a 3-goalie design, professional-grade rods, patented split bearings, and urethane texture for effortless maintenance and improved ball control. Moreover, its maple design (1.5” thick cabinet) shows off a classic look that goes well with other furniture. Additionally, its rods are with a hollow core for lighter and smoother feel, while split bearings allow for an easy slide. Its natural wood handles, on the other hand, is designed with an octagonal shape for better grip while an abacus style of scoring is present on table’s both ends. Characteristic of every Tornado foosball table is their quality American-built makeup, the ”foot” design of each miniature player (cross-hatch toe), patented game parts, and a 3/4” playing field that includes amazing graphics for enhancing shot accuracy. Avail the Tornado Foosball Table – Reagan today! The Tornado Foosball Table – Reagan is perfect for your game room! It features a wooden finish, along with a 3-goalie design, professional-grade rods, patented split bearings, and urethane texture for effortless maintenance and improved ball control. Moreover, its maple design (1.5” thick cabinet) shows off a classic look that goes well with other furniture. Additionally, its rods are with a hollow core for lighter and smoother feel, while split bearings allow for an easy slide. Its natural wood handles, on the other hand, is designed with an octagonal shape for better grip while an abacus style of scoring is present on table’s both ends. Characteristic of every Tornado foosball table is their quality American-built makeup, the ”foot” design of each miniature player (cross-hatch toe), patented game parts, and a 3/4” playing field that includes amazing graphics for enhancing shot accuracy.